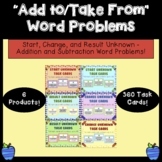 This is an interactive activity where students solve word problems with 2 digit numbers. This is great for google classroom or an interactive whiteboard. There are 10 problems included. Students solve join and separate result unknown word problems using a number line. 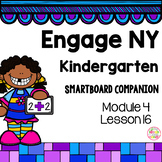 This is a great resource for google classroom or a smart board. Includes 10 word problems. 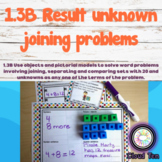 This is an interactive join and separate result unknown word problem activity that is Halloween themed. This includes 10 problems. It is great for google classroom or an interactive whiteboard. 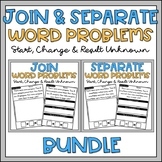 This is an interactive join and separate result unknown word problem activity. Includes 10 problems. Great for google classroom or an interactive whiteboard. 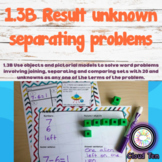 This is an interactive activity where students solve separate result unknown word problems. This can be done whole group on an interactive whiteboard or independently on a computer, I download it to google classroom and my students complete it independently. 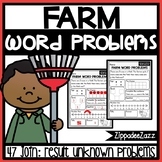 Four result unknown, two-digit word problems geared toward second grade. No regrouping necessary. 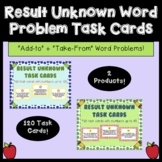 Start - Change - Result Unknown Task Card Word Problems - 360 Task Cards!